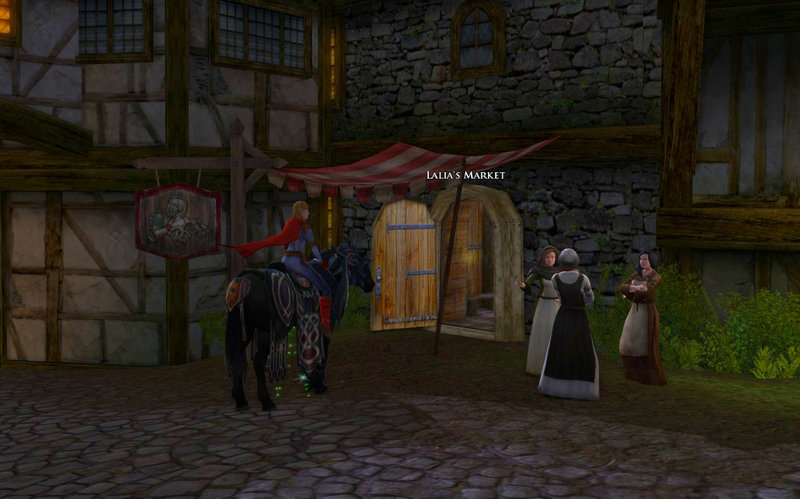 With Update 11, Lalia’s Market came to Bree. I really do like this idea. In the past, some people complained about the seamstresses putting mannequins out in the congregational hubs out in the world. I did notice some mannequins wearing the latest in fashion in Galtrev but otherwise, I am not looking for them so they never fazed me. In Galtrev, it felt like a shopping area under the gazebo where they were located anyway. Now, Lalia set up a permanent shoppe in the center of Bree. Let's take a look. A walk inside reveals that there is a long hall with vendors on either side. 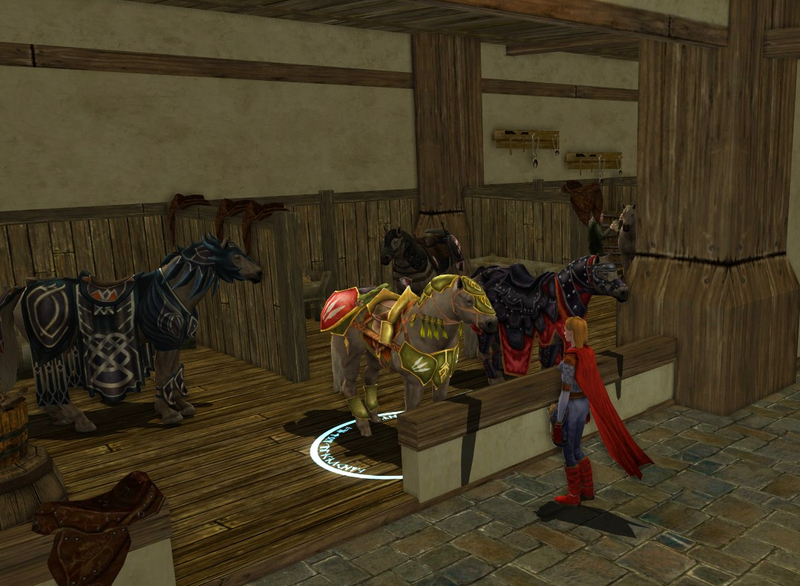 There are horses, and horse cosmetics, and clothes of all kinds on display. There is also a Vault, with easy access to pass your Bound to Account purchases to the rest of your team. Of course, I visit with the warsteeds. The warsteeds Lalia has in the horse stall the night I visited were (L-R) the Obsidian Steed, the Steed of the Warden (dyed yellow), the Steed of Victory, and the Steed of the Guardian (background). I didn’t check to see if all four were for sale since I already have them (see more images of all the store steeds at All-the-Steeds/ store-steeds), but I would guess that is why they are in the Market. Here are some poppets break dancing in the shoppe. An orange butterfly looks on amused. I don't think the poppets or butterfly are for sale. 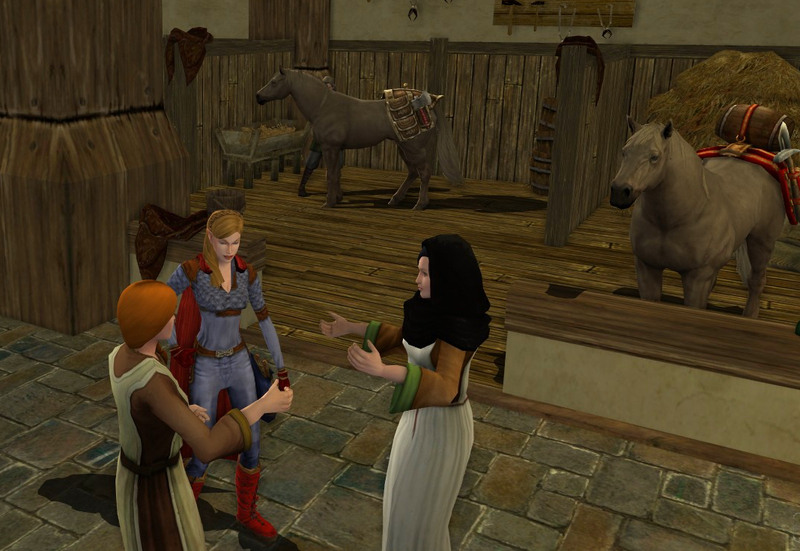 I catch up on the local gossip with two ladies of Bree. Word on the wind is that Spring festival will start this week. Hey look! There is Lalia! She has taken up selling dyes. Well, fancy that. I scope out her dye prices to see how DanaClaus our team Scholar can use the AH to undercut Lalia’s prices. As the items in the market use Mithril Coins as currency, one would think that given a choice, most people will be sure to check the AH first for dyes. The selection of cloaks is lovely. I think that if you look around though, you can find most all of these cloaks in game. My Draigoch cloak (top right) is still one of my favorite 3 cloaks; not to mention that it is the cloak I have equipped right now. I didn’t leave empty handed though. Being the practical shopper I am, I bought only a “Return to Lalia’s Market”. 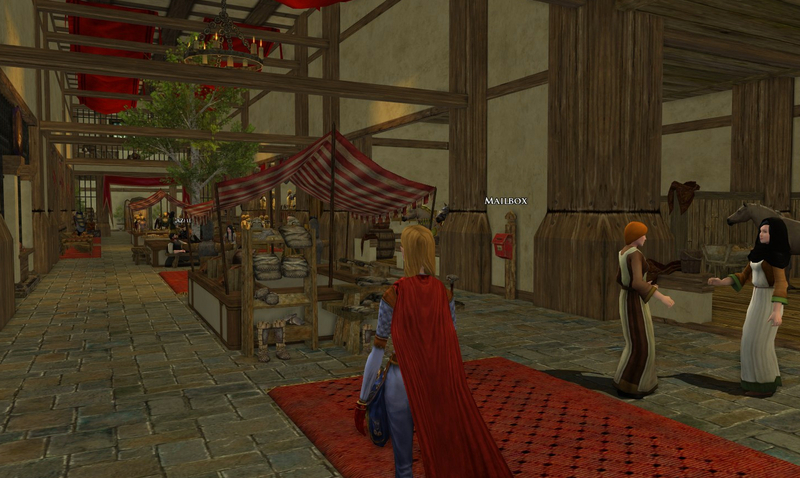 It is a permanent port directly to the market in mid-town Bree and cost only 3 Mithril Coins. Now that is a deal! Even if I don’t need anything from the shoppe, I do like to fly around. 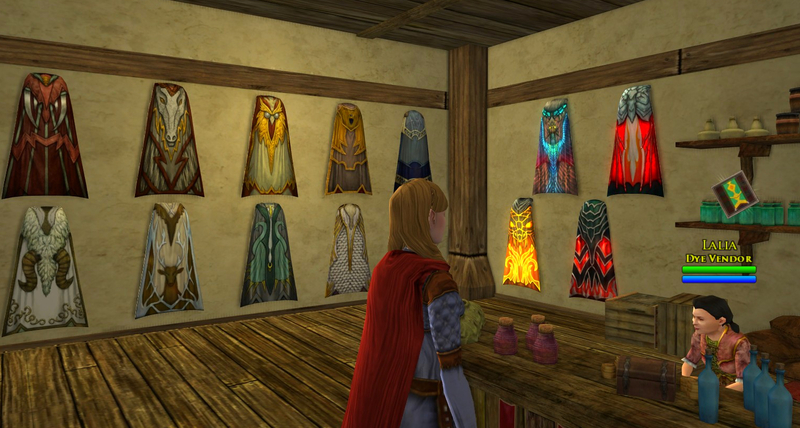 For the fashion-conscious, fellow blogger Cat, the Elven Tailor, took a much deeper look into the shoppe at the various rows of outfits. There are a bunch of them so go enjoy her pictures at The Elven Tailor/ thoughts-and-info-on-lailas-market. /glowing. I feel so honored whenever I'm mentioned on another Lotro blog. Thank you, Supergirl Danania! @ TheElvenTailor ... You are very welcome and most deserving. So, can you port there from anywhere, and walk out the door and be in Bree? And how does that compare in price to a milestone skill? Cleartrampoline ... you are very welcome. :) It is all I have bought from Lalia so far, but at leastI can check in with her often! Yes, you can port from anywhere to Lalia's and just walk out the door to Bree, midtown. It works just like any port. A milestone costs 350 TP. It can be set to any milestone. Lalia's Port costs 3 mithril coins (about 30 TP) but can only port to mid-town Bree. If you are kindred with Men of Bree, you can also buy a Port to West Bree; I think the cost is some low-end barter items (after you are kindred). Of course, that is over in West Bree and sometimes I want to port to Bree twice within an hour or don't want to ride aaallll the way into midtown, hehe. 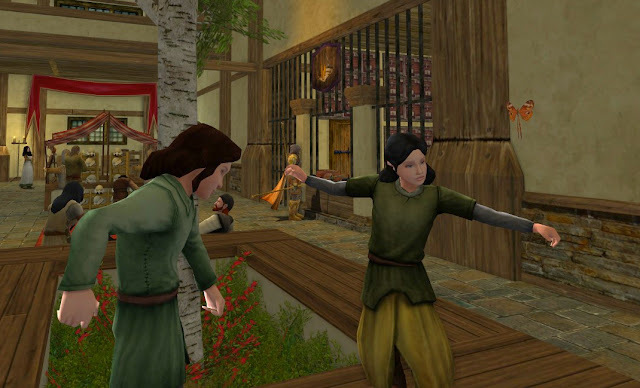 Upon achieving Men of Bree kindred standing, elves, dwarves, and hobbits can trade 100 Barrow-Treasures to Tad Leafcutter in exchange for a "Return to Bree" skill. It is not available to the race of man, but they receive a similar "Return to Bree" skill after slaying a couple billion wargs and reaching lvl 29. However, enabling it ties up a racial Trait slot. Alternatively, anyone (min lvl 12?--I don't recall)can buy the skill from the LotRO store for 295TP. Unlike milestone skills, "Return to" skills appear to have independent cooldowns. However, they require travel rations and the cooldowns are not shortened by Hurried Traveller. Thanks Halgoreth! Too bad I don't have a +1 on the comment function. :) Great answer, thanks for the assist! Brilliant, that Return to Bree skill had been taking up a Trait slot, and at 3 mithril coins its right up there with the universal tool kit for been a must buy, either for an alt...or a main, i totally missed it as well so thanks supergirl!. One thing that *dis*pleases me about Lalia's Market is that she sells the Busy Bee, Eager Beaver, and Hot Shot cloaks. Those had been exclusive rewards for completing the associated deeds. But now, anyone with a pocketful of Mithril can just buy them without having to earn the title. Why did I even bother? I worked very hard to complete "World Renown" to earn the Eriador Horse and "Ambassador to the Elves" to earn the Steed of the Elf-lords, but now they'll probably start just selling those, too. Does Turbine really think that people would still enjoy playing if the sense of accomplishment is removed? How rewarding are rewards if there's nothing special about them anymore? @ Ray Gil ... You are very welcome! You reminded me that the lildanas could benefit from this port (probably even more than me). Hooray for alts! @ Halgoreth ... aww, sorry Halgoreth. I notice less about the cosmetics as I do about the ability to buy Virtues in the store. That seems more wrong. But even then, if those people don't want the same sense of achievement and satisfaction from having earned it, it isn't negatively affecting me any. World Renown (kindred rep with 11 factions in Eriador), to me, seemed about the same difficulty as the Hot Shot deed (turn in 500 tasks). Both took many, many months of focused effort (and maintaining spreadsheets for strategy planning of what I could get where). Virtues, though. . .hasn't the LotRO store *always* sold them? I've not bought them, but I'm pretty sure I've seen them available since I first started playing. Some of my sense of achievement comes from knowing that I have earned an item that is difficult to acquire. If, instead, other folks can just buy the dang thing, the reward becomes somewhat hollow and I sometimes feel like a bit of a sucker for having spent time on it. "New Store Item: Pre-rolled Level 85 characters! Start right at the top so you don't have to do nuthin' but can pretend that you did!" "Special offer! Save yourself a couple of years! Now 20% off! Get Gwaihir to fly you directly to Mount Doom for only 2,000,000TP!!" If, when you say "Draigoch cloaks" you mean Wyrmscale cloaks, Lalia doesn't sell them, only the cosmetic appearance of them. However, the Hot Shot/Busy Bee/Eager Beaver cloaks she sells are completely identical to the earned versions because those deed reward cloaks are *also* only cosmetic. To me, Wyrmscale cloaks seem nearly impossible to get the materials for (unless, of course, you're more interested in raiding than in playing the game [but if that's the case, why the heck would you choose LotRO instead of some *other* fantasy mmo that's better suited for hack 'n slash?]). Each Wyrmscale cloak (lvl 75, 516 armour) recipe requires 3x Draigoch scales (which are rare drops from a creature that reportedly takes a large party hours to slay). Then, to trade the cloak for the Shimmering version (which has 811 armour! ), you have to defeat Saruman and hope he drops his cloak clasp. By the time I have the materials to make one, it will probably soon be made obsolete by some common drop or store item. Just because virtues have always been sold since the store originated didn't mean I ever thought it was a good idea. I am just ambivalent. Not so much now, though. I have met a couple of folks, though, who *were* particularly proud of having accomplished that deed and wear the cloak as a badge. But now I imagine that their reaction to Lalia's would be that it's like Wal-mart has started selling a cheap knock-off of their prized designer dress. The deed cloaks are distinctive, surely, but my main would probably never wear one.